By Rachel Held Evans, on May 31, 2013. 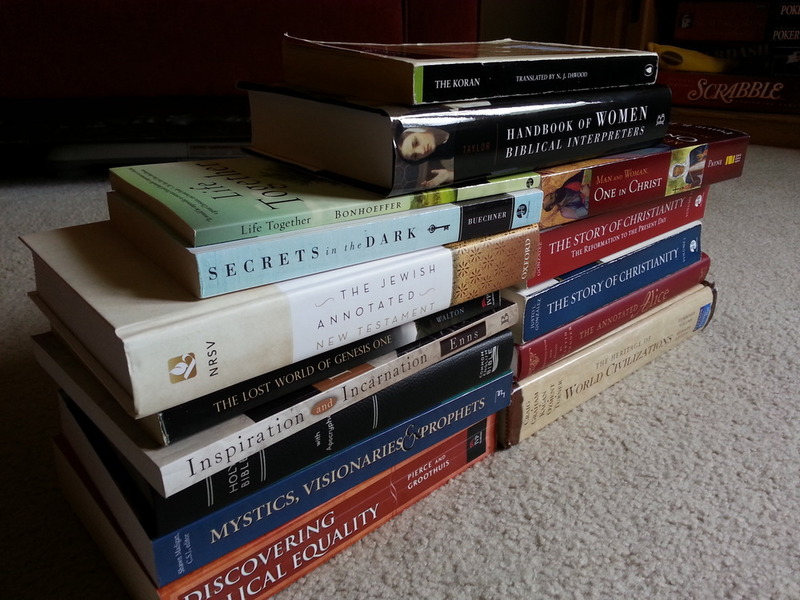 I have no concept of “light” summer reading. Summer is when you march yourself down to the local library, come out with more books than you can carry, and then beat the pants off all the other kids enrolled in the summer reading program by downing every Ramona book within a 50 mile radius like so many shots of vodka. Or, if you are older than twelve, summer is the time you bring The Complete Works of Shakespeare with you to beach, take a fat biblical commentary to the pool, or stay up late pouring over the contents of a used American history book, just to brush up on that stuff you learned in college. If you ask me, light reading is for the month of January when you need just one thing in your life to be easy and distracting. Summer—with all its extra light and time—is when the reading professionals emerge; it’s when things get serious. The Story of Christianity Volumes 1 and 2 by Justo L. Gonzalez: My big summer reading project this year is to learn more about church history. As I shared last week, it’s been an enlightening process! I love Gonzalez’s writing style and can heartily recommend his work as a primer on the topic. I’m planning to pair his books with Ruth Tucker and Walter Liefield’s Daughters of the Church, which several of you recommended as a good companion to Gonzalez’s work. The Jewish Annotated New Testament, edited by Amy-Jill Levine and Marc Zvi Brettler: This New Testament is packed with annotations and essays from New Testament experts, Greco-Roman historians, and theologians committed to helping readers better understand the Jewish content of the New Testament. It can be a bit overwhelming to start from the beginning with the intention of reading all the way through, so I recommend just replacing your regular New Testament with this one for a while to enrich your regular reading or devotional time. The Lost World of Genesis One by John Walton: I am often asked if I have any book recommendations for folks struggling to reconcile evolution and the Bible. I always start with The Lost World of Genesis One by John Walton. This slim, readable book actually doesn’t deal directly with evolution at all; instead, it examines the genre and context of the creation narrative of Genesis 1 in light of the ancient Near Eastern culture from which it emerged. If you love the Bible, you owe it to yourself to pick up this book at some point. Walton will only increase that love as you learn to embrace the Bible on its own terms, rather than those we tend to impose upon it. Additional recommendations for this topic include Peter Enns’ Inspiration and Incarnation and The Evolution of Adam. Handbook of Women Biblical Interpreters, edited by Marion Ann Taylor and Agnes Choi: This one will impress people at the pool, let me tell you. Arranged alphabetically, it explores the often-overlooked contributions of women interpreters of the Bible, drawing from the entire history of Christianity. But you don’t have to bee interested in biblical interpretation specifically to enjoy reading through all of these fascinating women’s biographies—from Saint Birgitta of Sweden to Catherine Mumford Booth to Anne Bradstreet to Catherine of Siena to Sojourner Truth. Life Together by Dietrich Bonhoeffer: Summer’s also a good time to catch up on some of those classic works you just never got around to reading. I’m hoping to get through Life Together on our vacation this year, as well as St. Benedict’s Rule. I’m also just now discovering Frederick Buechner and am wondering where he has been all my life! I highly recommend Secrets in the Dark if you too want to get started on this amazing writer and man of faith. Two other books I always read before starting a new book or major writing project include Walking on Water by Madeleine L'Engle and Bird by Bird by Anne Lamott. The Bible: Kind of a no-brainer, I know. If you’re looking to make things interesting, consider reading from a different translation. I’ve been reading from the Common English Bible, and am attempting to read the Apocrypha for the first time ever. The Annotated Alice: Mostly I just want to show off that I own this totally awesome volume. Makes an amazing gift and is fun to keep on the coffee table for conversation. Mystics, Visionaries & Prophets, edited by Shawn Madigan: My friend Tony Jones gave me this book and I’ve been eating it up, a little at a time. This anthology includes lengthy excerpts from the spiritual writings of notable women in church history—from Perpetua to Mother Teresa to Edwina Gateley. What I love most about this book is that the editor goes out of the way to include the voices of women outside the Western tradition. This is a nice change of pace from what you usually find in historical anthologies like these. Makes a nice companion to Gonzalez’s church history books! The Heritage of World Civilizations: I picked up the seventh edition of this college textbook for $4 at a used bookstore because I liked the pictures and because it was stressing me out that I was losing to my little sister in the history category of JEOPARDY. Like, I couldn’t remember when Alexander the Great lived or where Marco Polo was from. Sometimes you just need to brush up. I love rediscovering all these stories, and this volume has been fun because it does a good job of explaining what was happening across multiple civilizations during the same time period. It’s obviously not something you just sit down and read through, but it’s fun to have in hand for a lazy, rainy summer night when you find yourself wondering who came first—Plato or Aristotle.